Located on Coronado Island, just across the bay from San Diego, the Glorietta Bay Inn (619-435-3101, www.gloriettabayinn.com) was originally the home of John Dietrich Spreckels. The 11-room Italian Renaissance mansion was constructed in 1906, across the street from the Hotel del Coronado. Over the years it’s had a variety of owners, until a group of San Diego businesspeople acquired it 1975, and converted it to a hotel. Even though this stately mansion is a historic landmark, access upgrades have been made to the lobby, and accessible guest rooms were added to the inventory when a new wing was added. Accessible parking is available near the lobby, with a barrier-free pathway to the main building. Although steps grace the front entrance to the former Spreckles estate, a wheelchair-accessible entrance has been added in the back. Just follow the signs. Room 443 is a good choice for wheelchair-users and slow walkers. It’s located behind the main building, with accessible parking close to the front door. 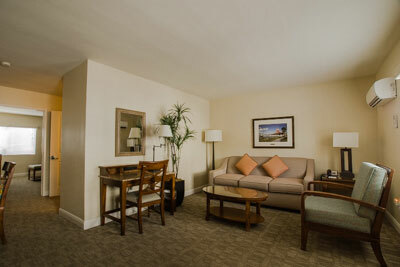 The one-bedroom suite features good pathway access, wide doorways and plenty of space. The living area is furnished with a 14-inch high king-sized sofa bed, a desk with a chair, and a dining table with three chairs. The adjacent kitchen is equipped with everything you need to prepare a tasty dinner, and it includes a stove with an oven, a microwave, a refrigerator and a coffee maker. There is also a bar with two stools in the corner. The spacious bedroom features a king-sized bed with access on both sides, and a lowered closet rod in the closet. The bathroom is equipped with a roll-in shower with a hand-held showerhead, grab bars and a fold down shower seat. The toilet grab bars are located on the left and back walls (as seated), and there is a sink with a large vanity area in the alcove just outside the bathroom. There is good pathway access to the public areas of this garden-like property, and the swimming pool is equipped with a pool lift. Best of all, it’s located right across the street from the ocean. If you’d like to explore the beach, just follow the sidewalk out to the Central Lifeguard Station, where motorized beach wheelchairs and surf chairs are available for loan. Use the intercom at the lifeguard station to let the lifeguards know you’d like to borrow some equipment. Advance reservations are also taken at (619) 522-7346. Either way, make sure and schedule some time to enjoy the beautiful beach. It’s just one of the many perks of staying at the Glorietta Bay Inn.